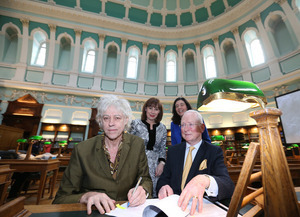 Freeman of Dublin Bob Geldof and Minister for Culture, Heritage and the Gaeltacht Josepha Madigan (top) as the Band Aid Trust hands over their archive to the National Library of Ireland’s Dr. Sandra Collins and Paul Shovlin (above). 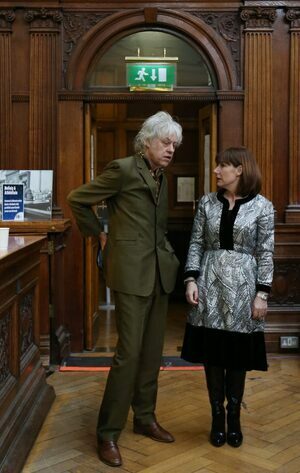 Posted in Misc and tagged Band Aid, Bob Geldof, Josepha Madigan at 2:46 pm on December 20, 2017 by Bodger. Met him once and he’s exactly as you’d imagine. Smells like a wet dog? True story. Did some work with a large Irish NGO. About 8 or 9 years back, had to pick him up from the airport for a shindig he was talking at for us. 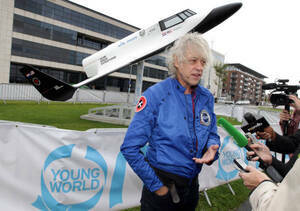 When he saw the Opel Zafira (the org’s car) he went nuts. “Where was is phuckin’ Merc? Did we not know he was doing this for nuthin’? Did we not appreciate all he does for us? “(pox all truth be told)…. And so on he went from the airport right the way into the city…. By the way, my Father in Law used to do business with Bob’s father….. a lovely, darlin’ man… a gentleman by all accounts…. You mean like guys who think Myers has a “right” to spew racist nonsense? He’ll probably ask for it back in January. 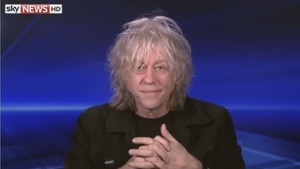 Nice threads Bob, except for the shirt. Can’t say the same for Josepha. Feh! No pictures! That’s no good to me at all. I want pictures of all my 80’s boyfriends. Why the hell did the National Library show an interest in that crap? Yeah – seems to be a load of worthless poo, sort of stuff you’d get a skip for if you were moving house. I think it’s just like the real world, most people are nice and the ones that aren’t just try your best to ignore. This place does produce more than the average though. Vile people. Stop. I’ll start crying again and I don’t need that at this hour. At least Bob is not a traveller hater.. Of course, the scale of ethnic cleansing in Mount Merrion can’t be compared with Myanmar, but the principle is the same. Live Aid raised more than £150 million for famine relief. I’d say there are plenty of African kids alive today as a result of it who would forgive Sir Bob being a bit of a bollox. But hey,keyboard warriors rule the world. being totally shallow here but what is he doing with that bottom button done up…. remember the rule ‘ sometimes, always, never’ …oh the humanity!! !